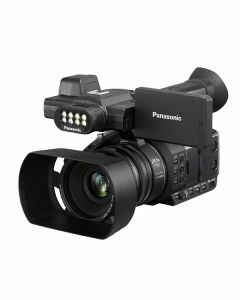 Panasonic’s AG-AC30EJ LED video light, with two light filters included, permits consistent shooting even for night-time scenes and dark places thanks to a colour conversion filter that manipulates colour temperature while the diffusion filter tempers the light source. The exceptional low-light characteristics of the camcorder owe their thanks to the integrated, newly-designed 1/3.1-type BSI sensor which enjoys a high image quality of 6.03M effective pixels. This allows for light, impactful shots in the darkest of places. The AG-AC30EJ’s potent 20x super-high-resolution zoom can be made use of for shooting scenes where it’s impossible to get amongst the action. Intelligent Resolution technology permits for shooting at high zoom rates without damaging the image resolution. The 29.5mm wide-angle (35mm equivalent) squeezes far more into the frame, particularly useful when wanting to take a group shot in a small room. To adjust for horizontal tilt and hand-shake blur the HYBRID O.I.S. + deploys five-axis correction to systematically counteract blurring – across the spectrum from wide-angle to powerful zoom shots. The AG-AC30EJ also luxuriates in steady images when shooting while walking or during other states of motion. The incorporated Level Shot function instinctively detects and corrects the tilting of captured images. The 1,555K-dot-equivalent colour viewfinder can be adjusted for extra comfort. The flexible 3-type Slide-Retractable LCD of the camcorder has touch operation and acts as a high-definition, 460K-dot monitor and menu-setting touch panel. After use, it slots into the handle front for additional mobility and security. It also spins 270 degrees vertically for easy high-angle, low-angle and self-interview shooting.